Clothing is essential for everyone. Clothing can be worn for covering the body, for climatic conditions like warmness or coolness, personality improvement and occasionally to exhibit one’s position in the society. From the extensive clothing manufacturer and commercial to the seller and the end-user, the customer, each and every one considers apparel as main thing. Knitted goods manufacturing divisions are mainly for apparel production, stitching centers and customers. The additional division manufactures finished apparel such as hosiery, sweaters, lingeries and underwear. The knitted fabrics have the benefit of stretch ability which offers fitness and comfort for the wearers. Knitted fabric gives warmness to the body. At the same time, they are absorbent and provide breathing comfort. It is less in weight and wrinkle free, should not be compulsorily iron able. Although, some specific techniques like Pak- nit or Perm sized have to be used, so that it may not shrink in their size too much. Care should be taken because not even a single loop breaks. If any one of the loop breaks, a gap can be made and it begins to run fully. This difficulty can be reduced by differences in the stitch that keeps the fabric from unwinding. 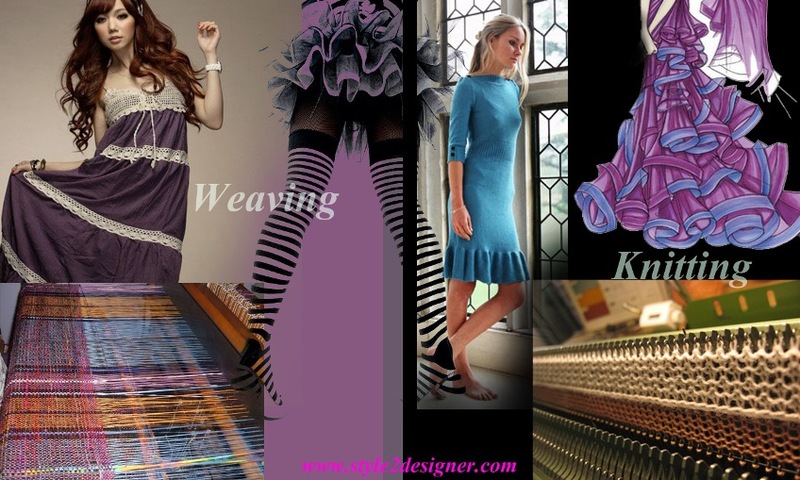 Weaving is a most important process of making fabric or cloth. In weaving, two different sets of yarns called the warp and the filling or weft are interlaced with each other to form a fabric. Yarn is an extended continuous span of interlocked fibers. The lengthwise yarns which run from the back to the front of the loom are called the warp and the crosswise yarns which are the filling or weft. Generally, weaving involves using a loom to interlace two sets of yarns at right angles to each other, the warp yarn which goes in the direction of the length and the weft (older bark) that crosses it. Single warp thread is called an end and Single weft thread is called a pick. A loom is a device of equipment for holding the warp threads in place while the filling threads are woven through them. Yarns made from natural fibers like cotton, silk, and wool and synthetic fibers such as nylon and Orlon are normally used for weaving fabric. But other fibers can also be used for weaving. Yarn projected for the warp runs through some processes such as reeling, warping and slicing to systematize them to endure the damage during weaving process. The majority of woven products are made with one of these three basic weaves: plain weave, satin weave, or twill weave. Woven cloth can be fashioned in plain or in one color or it contains some simple patterns, or can be fashioned by decorative or artistic designs.